To help policymakers understand the implications of water problems for national security, World Wildlife Fund-U.S. is working with global experts to produce a book highlighting water conflicts and U.S. strategic interests. Four experts spoke at the Wilson Center on May 9 about the dynamics at play in India, Pakistan, and the Philippines. The World Economic Forum’s 2016 risk survey ranked water crisis as the top risk globally in the next decade. Among experts, there is growing concern about water issues and state fragility. “When government fails to provide basic water services, when they fail to protect the people against drought and flood, fail to preserve water resources captured by the elites, there is a potential loss of legitimacy and an opportunity for other parties to exploit those failures and deepen the instabilities,” said Claudia Sadoff, the World Bank’s global lead for water security and integrated resource management. It is essential and urgent to “design and prioritize water programs that will lead to stability, development, and prosperity,” she said. “The earth has been pushing India hard with droughts, floods, typhoons, and extreme weather conditions affecting economies in every part of the country,” said Schneider, who has written about the region extensively for the Wilson Center as part of the joint “Choke Point” series. In the northern Himalayan state of Uttarakhand, a hydropower push was meant to help solve electricity woes. However, in June 2013, the area was hit by major flooding that may have killed as many as 30,000 people and broke 10 dams as water rushed down narrow mountain valleys, said Schneider. Now large-scale infrastructure plans are being reconsidered. In the northwestern farming states of Punjab and Haryana, free and unlimited access to electricity and water means “the water pumps run all day long which drain the aquifers and produce huge surpluses,” said Schneider. “Half the electricity in Punjab and Haryana is being used to pump water.” As a result, groundwater levels are receding rapidly, while tons of rice sit in storehouses, much of it rotting away before ever being used. In Chhattisgarh, in eastern India, waterways are being soiled and aquifers depleted to support a push to boost domestic coal mining, even as coal plants are canceled in other areas of the country and as much as 27 percent of generated electricity is lost over transmission lines. In all, of 16 so-called “Ultra-Mega Power Projects” around the country proposed in 2015, immense coal plants that would have produced up to 4,000 megawatts of electricity each, only 2 are still going forward today, said Schneider. In Tamil Nadu, home to one of the canceled plants, a 648-megawatt solar installation was opened last year instead, and other states are making similar moves. Overall, global coal production has actually declined in recent years due in no small part to India’s significant changes, he said, and Narendra Modi has emerged as an unlikely leader for economic development and sustainable goals. 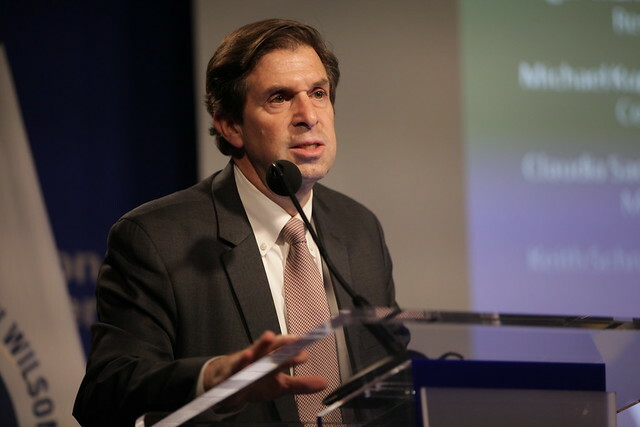 Water conditions are also challenging development in next door Pakistan, said Michael Kugelman, deputy director of the Asia Program and senior associate for South Asia at the Wilson Center. What’s more, there is often a national security dynamic to deliberations about water in Islamabad. Pakistan relies almost exclusively on the Indus River and its tributaries, and the river originates across the border in India. As a result, “there is nothing apolitical about transboundary water management,” Kugelman said. Strains have mounted as the aquifers in the Indus Basin drain with little or no signs of recharge. Pakistan faces both increasing water scarcity and major incidences of flooding. The country was hit by major floods in 2010, affecting more than 20 million people and an estimated $5 billion damage to the agricultural sector, and again in 2011, 2012, and 2013. The southern coastal city of Karachi, which has long provided opportunities for rural communities, has now become increasingly vulnerable to sea-level rise and stronger storms, causing reverse urban-to-rural migration and concerns about instability and radicalization, said Kugelman. Meanwhile, Pakistan uses water at a tremendously high rate. The agricultural sector is dominated by elites who practice water guzzling techniques aided by government subsidies, said Kugelman. Poor infrastructure and maintenance, and few waste-water treatment facilities cause further wastage and pollution. Such inefficiency is complemented by a lack of public awareness and general apathy. Traditional power structures help perpetuate inequitable land and water policies, “creating feudal-like conditions,” said Kugelman. Food security has suffered and as of 2016, Pakistan scored a 48 out of 100 on the Global Food Security Index, with 22 percent of its population undernourished. There are “voices from both sides of the border that have called for the treaty to be renegotiated,” however, and India actually threatened to withdraw after a terrorist attack on a military base in disputed Kashmir last fall. Kugelman said that though the treaty is certainly being challenged by climate change and population growth in both countries, there is not enough trust and cooperation between the two countries to allow for a renegotiation currently. “Water is deeply intertwined [in] longstanding political disputes between India and Pakistan… It is 100 percent wrong to claim water is a ‘soft’ issue,” he said. “There is more to the Philippines than Manila,” said Roger-Mark De Souza, director of population, environmental security, and resilience at the Wilson Center, and there’s more to Mindanao than conflict. While instability in Mindanao, the southern island that has made headlines for a nearly 50-year-long insurgency, has roots in ethnic, religious, and political tensions, water too has played a role. The Philippines, like Pakistan, is consistently listed among the most climate-vulnerable nations in the world because of its exposure to extreme weather. Since 2006, the archipelago has been blasted by 5 of the 10 strongest storms in its recorded history, including 2013’s devastating Cyclone Haiyan (or Yolanda as it’s known in the Philippines). Mindanao, normally the nation’s breadbasket, has faced major drought as well, striking the economy hard. In April 2016, thousands of hungry farmers in Cotabato Province sought relief in urban centers, while Zamboanga City has been forced to ration water. Agriculture accounts for more than 48 percent of jobs in Mindanao and contributes 14 percent of the nation’s GDP, said De Souza. Non-agricultural development has been slow and sometimes controversial. A proposed dam near the Liguasan Marsh is contested because it would flood thousands of acres of existing farmland, drain a marsh claimed as an ancestral homeland by some groups, and – the locals fear – pave the way for oil and gas exploration, said De Souza. Indeed, disputed land and natural resource rights are at the core of Muslim separatist movements on the island. Conflict with Manila over these and other grievances will continue to play out but could take on a different tone with the election of Rodrigo Duterte as president, the first ever Mindanaoan to hold the office, said De Souza. Though he has professed a strong anti-Western agenda, Duterte also has many reasons to work more closely with the United States on counter terror operations and development programs, especially now as ongoing clashes with Islamist militant groups have forced him to declare martial law in Mindanao for 60 days. The three case studies show the complex nature of water management and its effects on society. The United States has ample strategic reason to help the Philippines and other governments adapt to changing conditions, said WWF-US Senior Policy Advisor David Reed. “U.S. prosperity and national security depend directly on the prosperity and stability of its partner countries and competing countries around the world.” He added that with increasing insecurity and ecological change, it will be essential to identify the impact of water policies on human systems that cause social disruptions to head off the worst effects and steer toward positive outcomes. The panelists suggested improving communication at the local level, making more of an effort to spread messages of conservation to hard-to-reach rural and urban communities through radio, social media, and other mediums. Additionally, it will be essential to target stakeholders who have the power to make a difference, such as the military in the case of Pakistan, said Kugelman. He also suggested that incorporating water into climate-sensitive policies is especially important, given the resources and attention that climate policies sometimes command. “Opportunities must be recognized to link defense, diplomacy, and development efforts particularly in the context of water management,” said De Souza. Written by Namita Rao, edited by Schuyler Null.